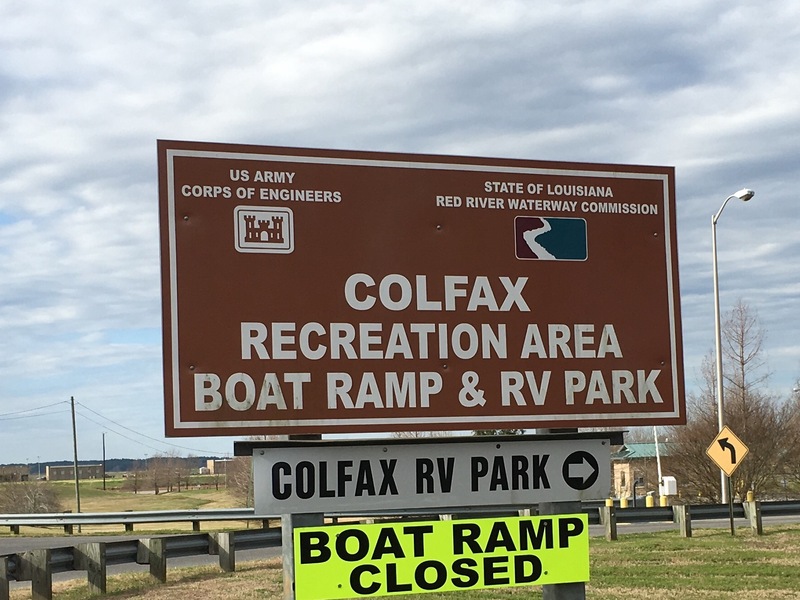 Colfax Recreational RV Park – Let's Go RVing! Since we just had 130 miles to go today we didn’t rush to leave so it was after 10:00 before we were loaded with slides in and the car on the dolly. Then I had to walk around and say good-bye to all who were up and about. I missed some either because they had already left for their day’s activities or because they hadn’t emerged from their cocoon yet. We had a very uneventful drive fortunately. Always love uneventful! Colfax appears to be a very small town. Of course it’s difficult to tell on a Sunday afternoon. The campground, Colfax Recreational RV Park, is a Corps of Engineer park and with our America the Beautiful pass all of our stay was half priced. That makes it nice as it is only costing us $64 to stay for four nights and we have full hook-up and free Wi-Fi. No cable but our Dish works fine. After getting set up we had some lunch and then took a walk around the park. It’s located right on the Red River, a seemingly muddy river that empties into – well, perhaps the Red River. I don’t know. We were quite impressed with what we saw. Although it’s not opened due to high water there is a very nice boat ramp with nice pier and access. It was rather windy so we didn’t stay out long. Later in the day Jerry talked with the host and he said that he had worked on an oil rig for 31 years but now with oil at $30 a gallon there is no new drilling going on so many people are being laid off. Wow, imagine being laid off after 31 years. This is a beautiful park but at this time of year very underutilized. There is only one other RV here, an older fifth wheel. The weather is beautiful, a nice 70 degrees although there is a chill in the air as the sun goes down. It is so quiet probably the quietest campground we have ever stayed in. After being in such busy places for the last two weeks the quiet is nice! Looks like dinner and an early night so we can be up and about and on our way to Natchitoches tomorrow!